For Carl Larsson (1853–1919), painting was a route out of the abject poverty and abusive environment of his childhood. You’d never guess from his later watercolours of his wife and children enjoying family life together in an ideal and idyllic Swedish home. Larsson’s later collections of paintings were, and remain, hugely popular in books, regularly making the best-seller lists throughout northern Europe in the early twentieth century. My aim in this short series of articles about his work is to get better insight into the real Carl Larsson, who painted rural scenes in France long before those books appeared, and whose last great masterpiece was still mired in controversy when he died. His life and work also make a fascinating contrast with those of his Norwegian contemporary, Edvard Munch, for example. If they didn’t die during an outbreak of cholera or other infectious disease, many escaped by emigrating to America. Larsson’s opportunity to escape came when his talent for art was spotted when he was attending the local Poor School. He was encouraged to apply to the main school of the Royal Swedish Academy of Arts, and succeeded. He proved an excellent student there, winning a medal for his life drawing, and he started to produce graphic work for newspapers. 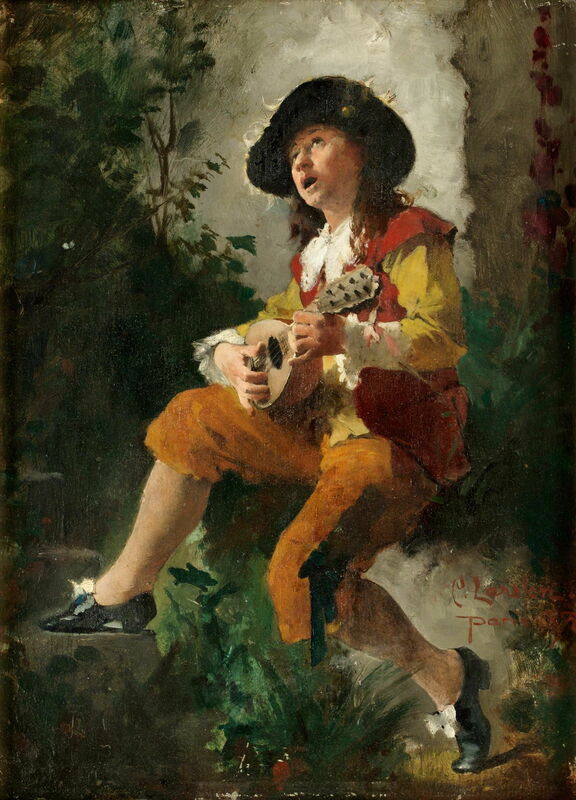 Strömkarlen (The Musician) (1878) is one of his earliest surviving paintings, made while he was living in Paris. At this time he felt that he should become a history painter, and remained detached from the changes being brought by the Impressionist movement. Carl Larsson (1853–1919), Idyll (c 1880-82), oil on canvas, 70 x 48 cm, Nationalmuseum, Stockholm, Sweden. Courtesy of Nationalmuseum, via Wikimedia Commons. 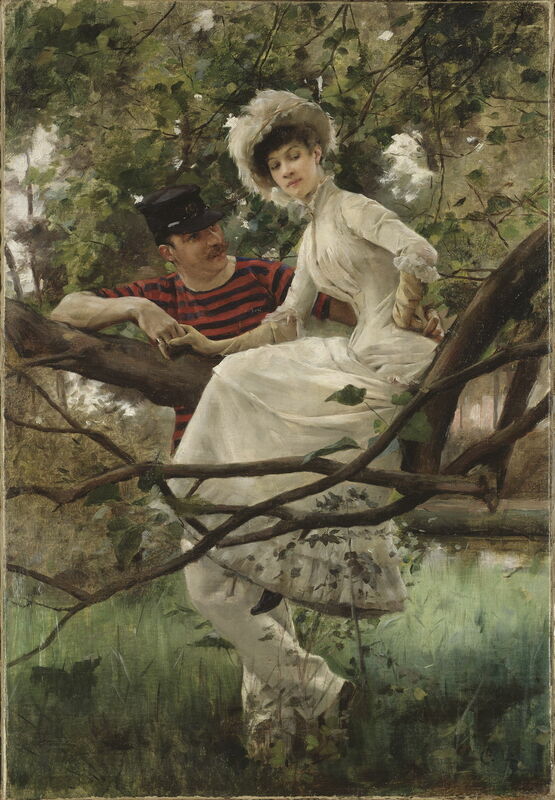 Larsson’s Idyll is thought to have been painted when he was in Paris, in the period 1880-82, and his model may have been the French woman with whom he was living at the time, known only as Gabrielle. This appears to have been Larsson’s first and last figurative painting of contemporary life in Paris. 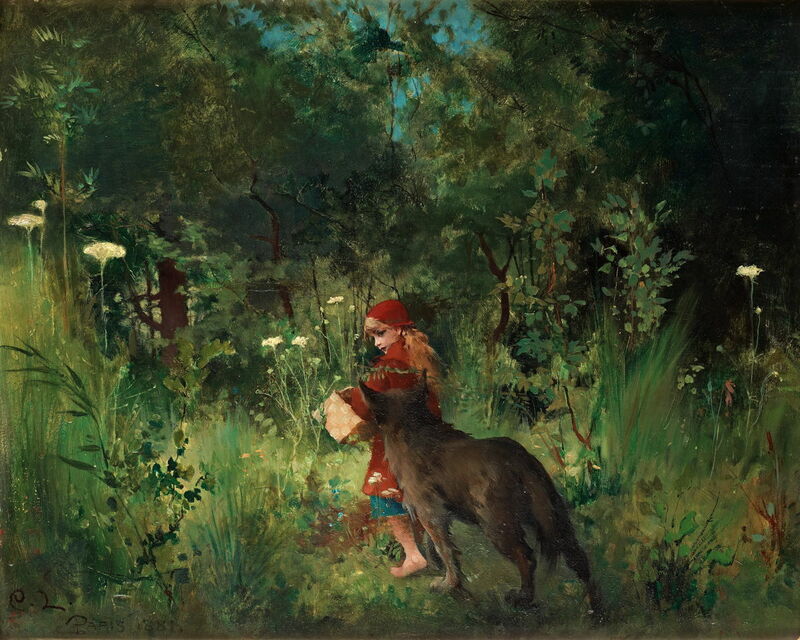 Larsson also started to paint some motifs drawn from popular tales, here of Little Red Riding Hood and the Wolf in the Forest (1881). These may have been related to illustration work in which he was engaged. 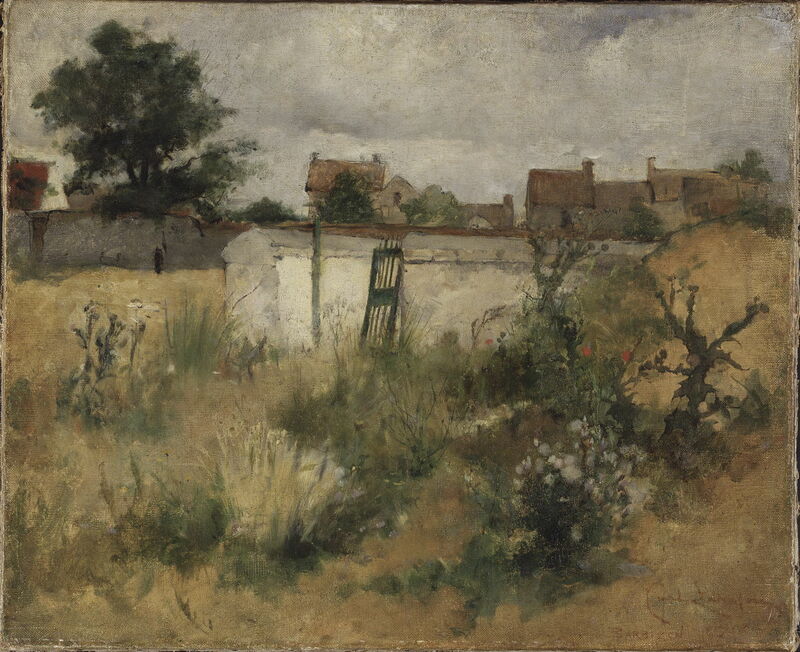 In 1882, he joined the artists’ colony at Grez-sur-Loing, which was popular with Scandinavian artists at the time, as well as several notable Americans including John Singer Sargent. There he met, and later married, the artist Karin Bergöö, and became accomplished in watercolours. 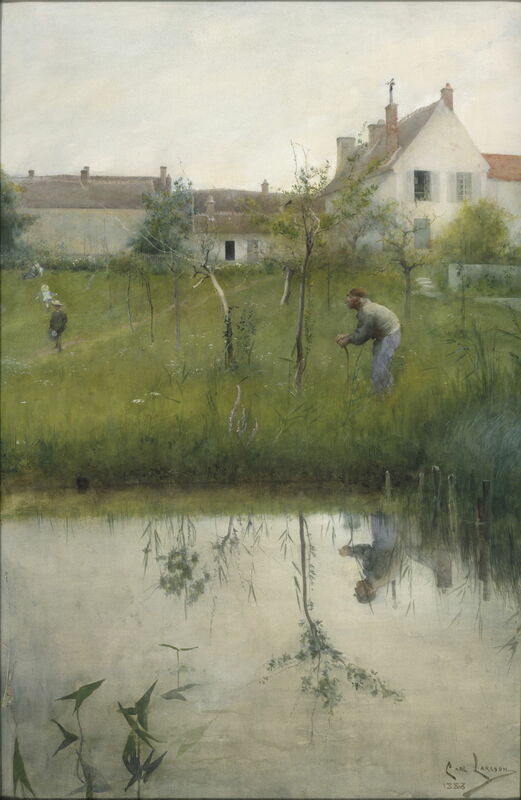 Larsson’s paintings from Grez appear to have been influenced by Jules Bastien-Lepage, who was to die unexpectedly in 1884. 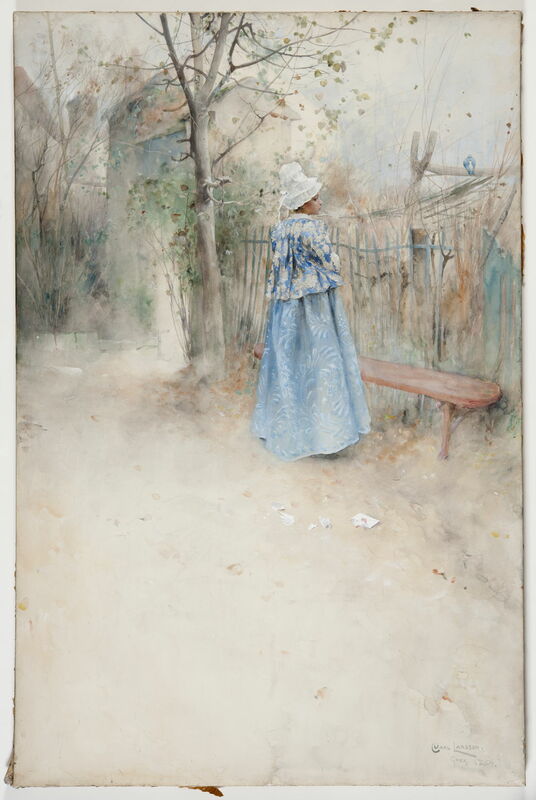 Larsson’s watercolour of The Old Man and the Nursery Garden (1883) shows similar muted colours, and common rural themes. Carl Larsson (1853–1919), The Bride (1883), further details not known. Wikimedia Commons. 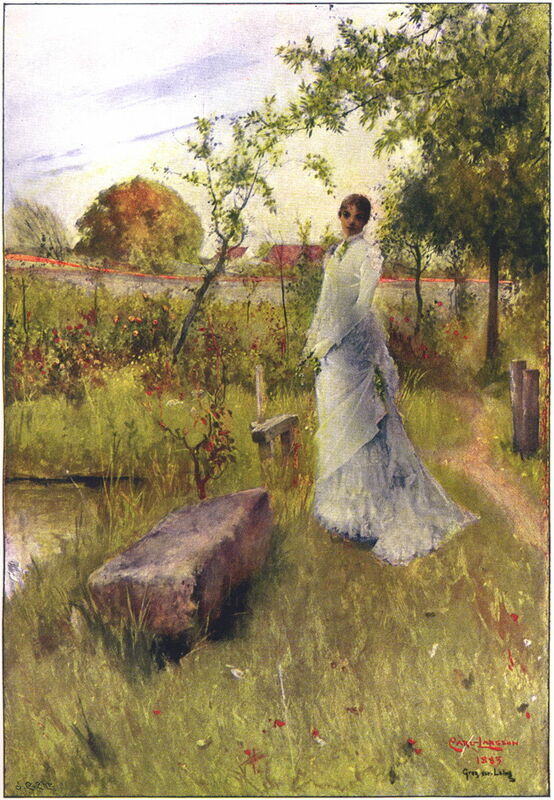 He painted this touching portrait of The Bride (1883) at Grez. It almost certainly shows his wife Karin, and was presumably made as a wedding gift to her. 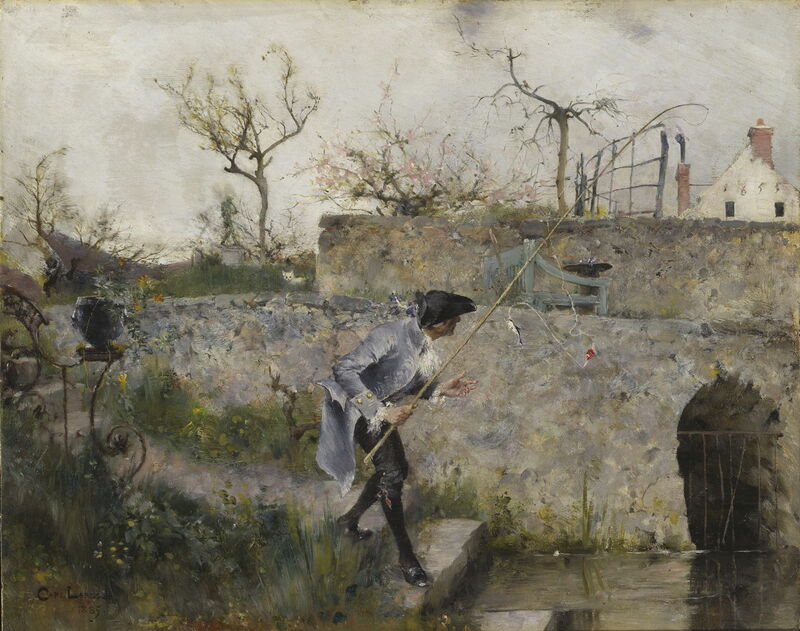 Carl Larsson (1853–1919), À la Campagne (In the Country) (1883), further details not known. Wikimedia Commons. 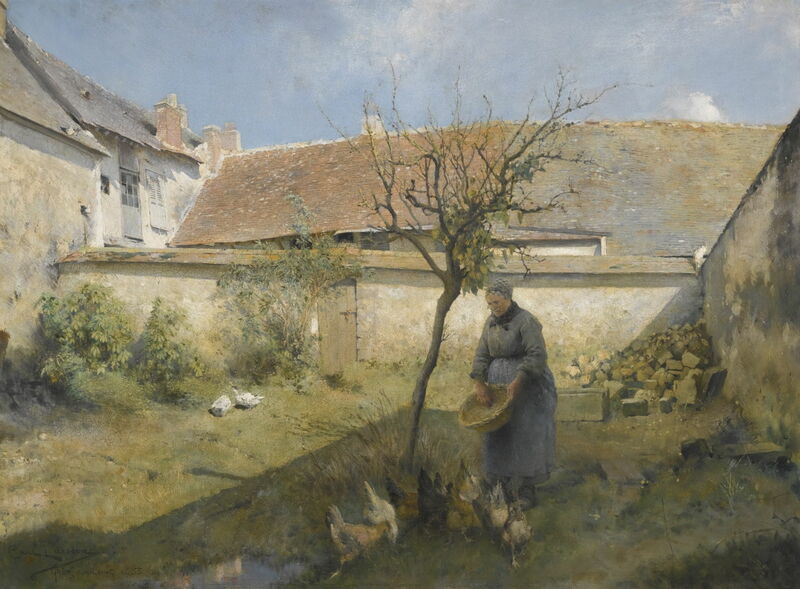 À la Campagne (In the Country) (1883) is typical of a number of views that he painted of the rural poor in and around Grez, in the same realist style with soft colours. That year, he had his first painting accepted by the Paris Salon, and was getting valuable commissions for book illustrations. Carl Larsson (1853–1919), The Vine (painting 1 of diptych) (1884), watercolour, 60 x 92 cm, Nationalmuseum, Stockholm, Sweden. Courtesy of Nationalmuseum, via Wikimedia Commons. 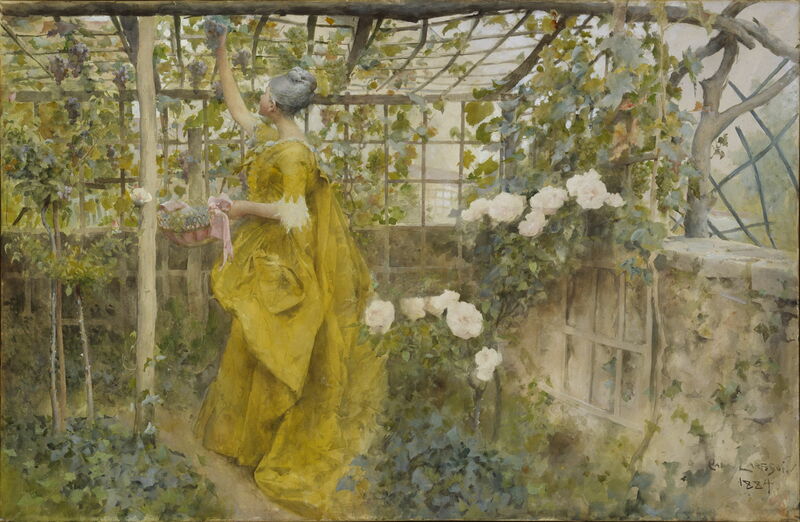 Late during his stay in France in 1884, Larsson painted The Vine, a watercolour diptych which is considered to be a gently humorous allegory of love. In the first painting (above), a woman picks grapes which are turned into wine. This then gets the man in the second painting (below) drunk. The diptych was bought when it was shown in Stockholm the following year, and was later lent for exhibition at the World’s Fair in Paris in 1889. Carl Larsson (1853–1919), The Vine (painting 2 of diptych) (1884), watercolour, 60 x 92 cm, Nationalmuseum, Stockholm, Sweden. Courtesy of Nationalmuseum, via Wikimedia Commons. In 1884, a year after they married, the Larssons had their first child, as shown in this wonderfully intimate pastel double-portrait of A Studio Idyll. 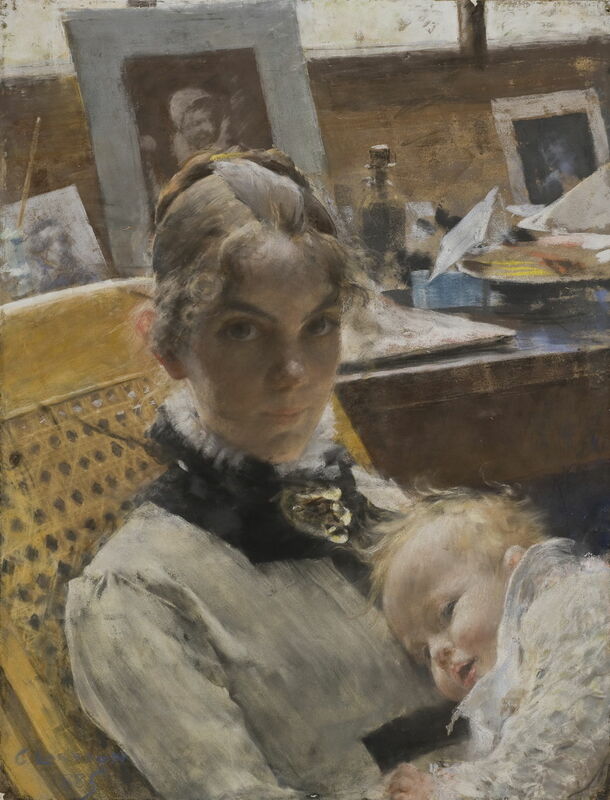 The Artist’s Wife and their Daughter Suzanne (1885). Mother and child are sitting in Larssen’s studio. A talented artist in her own right, after their wedding, Karin Larsson concentrated on interior design, and was responsible for most of the household interiors shown in Larsson’s later paintings. Carl Larsson (1853–1919), A Bite! (1885), oil on wood, 32.5 x 41 cm, Nationalmuseum, Stockholm, Sweden. Courtesy of Nationalmuseum, via Wikimedia Commons. At their best, Larsson’s watercolours and oil paintings converge in their appearance. A Bite! (1885) was painted in oil on wood, and comes closest to resembling his best watercolours. As with Autumn above, its single figure is dressed in period costume from the previous century. Larsson was also working on illustrations for a book set in the eighteenth century while he was in Grez. Although Larsson never really embraced Impressionism, several of his works show clear Impressionist influence. 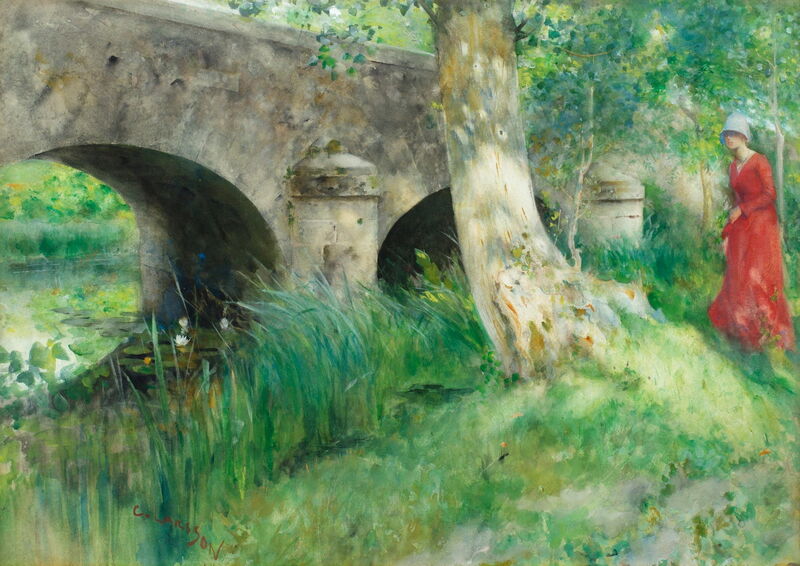 In his watercolour The Bridge in Grez, Medieval (1885), he uses a combination of high chroma colours applied with generally loose brushwork. Coupled with the much more contemporary fashions shown, it appears far more modern. Carl, Karin and Suzanne Larsson moved back to Sweden in 1885, where their first task was to find somewhere to live. 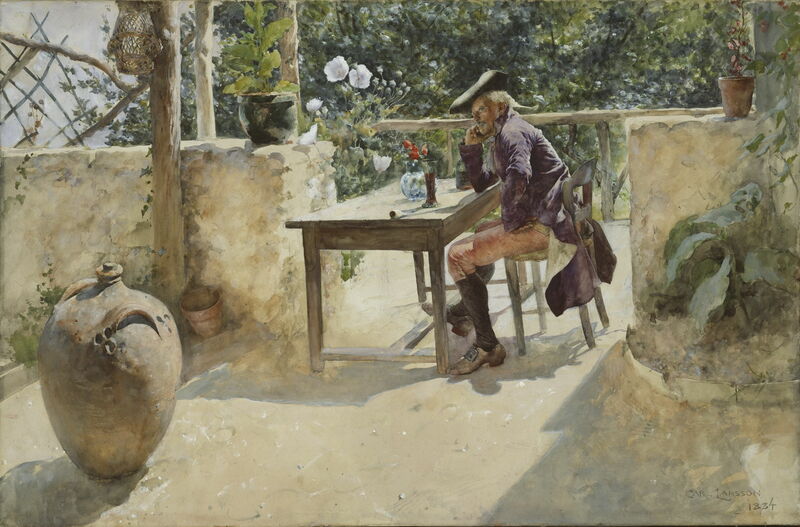 Then Carl Larsson had to establish himself in the Swedish arts market. Posted in General, Painting and tagged Barbizon, Bastien-Lepage, Larsson, Munch, painting, Sargent, Sweden. Bookmark the permalink.